NASA's Mars Reconnaissance Orbiter snapped this shot of a trough running down the center of a valley in the Tartarus Colles region of Mars. Scientists think the structure originally formed as a lava tube. 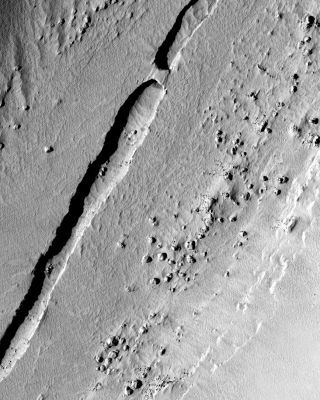 Ice within lava tubes on Earth can host bacteria in cold, Mars-like conditions, hinting that life could dwell in similar lava tubes on Mars, researchers say. The microbes in question were collected from a lava tube near Newberry Crater in Oregon's Cascade Mountains at an elevation of 5,020 feet (1,530 meters). The bacteria resided within ice on rocks some 100 feet (30 m) inside the lava tube. "We found many, many microbes, many species," study lead author Radu Popa, a microbiologist and astrobiologist at Portland State University, told SPACE.com. One of the microbes is a species of Pseudomonas, one of the most common types of bacteria on Earth. "You can find its cousins in caves, on your skin, at the bottom of the ocean and just about anywhere," said study co-author Amy Smith of Oregon State University. "What is different, in this case, is its unique qualities that allow it to grow in Mars-like conditions." Moreover, these microbes can grow without organic nutrients such as sugars. Instead, experiments showed that without such food, they can subsist off the iron in olivine, which is common on Earth and Mars. "This reaction involving a common mineral from volcanic rocks just hasn't been documented before," Fisk said. "Now we know that olivine can sustain microbial life." In addition to this Pseudomonas bacterium, perhaps nine or 10 other microbial species are performing similar kinds of chemistry in this cave, researchers said. "We've been looking for the last 10 years for evidence that a microbe could live on olivine this way, and now we've found many such examples," Popa said. Since researchers have speculated about whether lava tubes could serve as potential shelters for life on Mars, Popa, who used to explore caves in his native Romania, suggested investigating lava tubes on Earth for life. "When temperatures and atmospheric pressure on Mars are higher, as they have been in the past, ecosystems based on this type of bacteria could flourish," Popa said. Altogether, the researchers suggest such microbes might be able to survive in subterranean lairs on Mars and other planets. "It all depends on how gentle conditions on Mars once were," Popa said. In the future, the researchers plan on analyzing how exactly these microbes are scrounging energy from olivine. "Do they need to stay in touch with the surface, or can they do it from a distance by producing a chemical agent?" Popa said. The team also wants to see how exactly these microbes alter the surfaces of the olivine they live off. "The fingerprints left by such bacteria on mineral surfaces can be used by scientists as tools to determine whether life ever existed on Mars," Popa said. The scientists detailed their findings online Dec. 14 in the journal Astrobiology.